And introduce myself! My name is Lisa and I live outside Washington DC. It’s an election year, so you can imagine how wonderful it is! I’ll outline what you need to know about me in a detailed list. 1. In one exactly one month I will be celebrating my 23rd birthday with my dad in the Wizarding World of Harry Potter. This tells you 3 things about me: I love Harry Potter, I actually like getting older, and I spend a lot of time with my dad. 2. A year ago I was studying abroad in Malaga, Spain for my last semester of college. Two months after graduating I got a job working in DC. Eight months into this job and I just received a 3 band promotion and still reminisce about Europe, frequently. I have no plans of moving out of my parent’s house until I can afford to buy a home. Especially since we’ve all proclaimed how much we enjoy living together. I promise I have basically no life. 3. I have genuinely terrible skin and a tendency to ramble. 4. My regular commute to work takes about an hour and a half, I ride a commuter bus and sleep most of the way, but music is a big deal. I’m one of those people who says I enjoy all kinds of music, but I’m also one of those very few people who means it. Banjo music? Classical? Britney Spears and Beyonce? Weezer? Come at me bro. 5. I have two cats. I am obsessed with them and neither one is particularly interested in me. Tigger is technically a family cat, at 16 years old. Minnie, however, is specifically my cat. Named for Minerva McGonagall because Harry Potter is life, she is 5 months and loves my parents significantly more than she esteems me. Even if I pay for her food and feed her everyday. 6. My father is a pastor and I am a Christian. I hesitate to say this because I generally dislike religious people. It’s been extremely interesting going through life as a pastor’s daughter and not necessarily easy. I was born in Staten Island, New York, when I was 7 we moved to Maple Grove, MN, and then after my first semester of college at 18 we moved to Maryland. Religion is easier now because I go to a church full of normal people without holy roller complexes and very few people are trying to be better than everyone else. That being said, I don’t have any hatred for what other people want to be, nor do I have the authority to tell them they’re wrong. 7. When I was 18 and failed out of my first semester of college due to laziness and lack of a future, I decided that when we arrived in Maryland I would get my Pastry and Baking certificate instead of my original plan to study Marketing. I was 3 months away and changed my mind… Enter a long list of schools I attended and cut to last December when I graduated with a BS in International Business. Now that I’m almost a year into the working world and on the brink of turning my job into a career I’m looking back and wishing I had gone to Pastry school. Thus, I begin this blog with the hopes that I can document my food-making (as well as a myriad of other hobbies) and use this site to contemplate what the next step in my life will be! I hope I’ve been interesting and you enjoyed! But I’m trying to be realistic too. 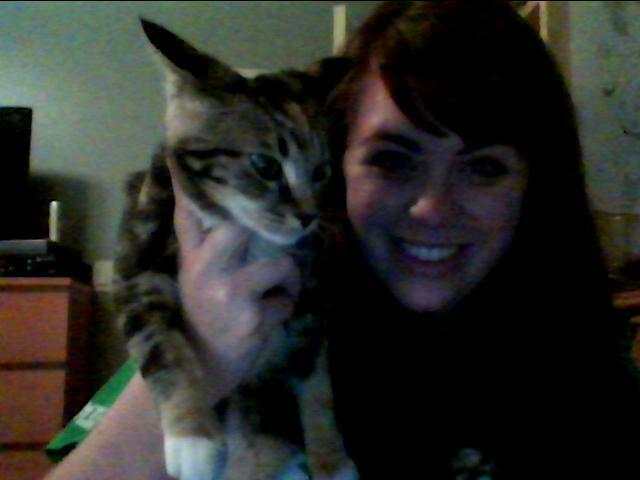 This is Minnie and me, she is obviously loving every second with me. This entry was tagged bad skin, cats, harry potter, introduction, pastry school. Bookmark the permalink.